The development of staff in prosthetics and orthotics to provide high quality clinical supervision, assessment and facilitation of learning is key to ensuring a positive commitment to education in the profession. Feedback from P&O practitioners indicates that, with ever increasing caseloads, many clinicians struggle to attend face-to-face sessions due to challenges with clinical schedules. The University of Salford in partnership with Health Education England (HEE) and The British Association of Prosthetists and Orthotists (BAPO), have therefore developed a programme of digital training materials to support P&O practitioners who educate and/or mentor both students and newly qualified colleagues. The content of the e-learning programme has been informed by P&O practitioners and is designed to help provide much needed flexible work-based support to complement current learning. It comprises three 20-minute sessions, highlighted by P&O practitioners as areas where they would like to receive more training. The sessions focus on building an effective mentor mentee relationship, providing effective feedback and dealing with students in difficulty. These sessions are designed to be interactive, comprising online materials and assessment of learning. This programme is suitable to support any allied health professional who is new to mentorship, looking to update current skills or as pre-reading material prior to attending a face to face session. The programme should be used as an adjunct to face-to-face teaching sessions on practice based learning. This session provides an introduction for clinicians to develop an effective learning relationship with students, new employees or those transitioning to a new department. This session provides clinicians with the skills required to provide effective feedback, therefore enhancing learner development for students, new employees or those transitioning to a new department. This session provides an introduction for clinicians to develop an understanding of the principles and techniques required to identify and support a mentee who is struggling to meet the required clinical standard as a student, new employee or those transitioning to a new department. 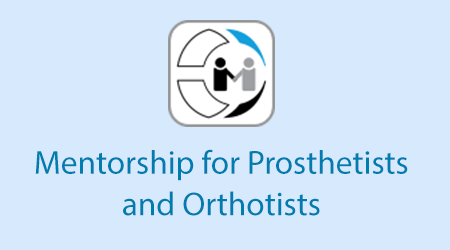 If you already have an account with e-LfH, then you can enrol on to the Mentorship for Prosthetists and Orthotists programme by logging in to the e-LfH Hub, selecting My Account > Enrolment and selecting the programme. You can then access the programme immediately in the My e-Learning section.